Demand for landscaping products in the US is forecast to expand 4.3% per year to $9.0 billion in 2021, driven by improving economic conditions and consumer spending, strong growth in new construction markets, healthy growth in improvement and repair markets, and increasing consumer interest in outdoor living. A number of factors will drive new growth for hardscape products, such as rising popularity of patios and outdoor kitchens, continued interest in home improvement shows, the introduction and increased availability of new products such as porcelain pavers, and concern for improved water management driving installation of permeable pavers. This study covers the United States landscaping products industry, defined here to include hard goods used in landscaping activities. 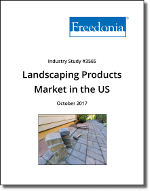 The report provides an analysis of the landscaping products market in the US by product (decorative, hardscape, outdoor structures, and other); market (residential, nonresidential, and nonbuilding); end user (professional and consumer/do-it-yourself); and region (Northeast, Midwest, South, and West). For the purposes of this study, hardscape items include concrete products (e.g., pavers, poured, blocks); wood; stones and boulders (e.g., manufactured, granite, sandstone); clay brick; aggregates (e.g., sand, gravel); and other. Consumables, equipment, and furniture are excluded from the scope of this study, as are any related service revenues. Historical data for 2006, 2011, and 2016 and forecasts to 2021 are provided for landscaping products demand in current dollars (which are not adjusted to account for inflation). Regional information is also provided.